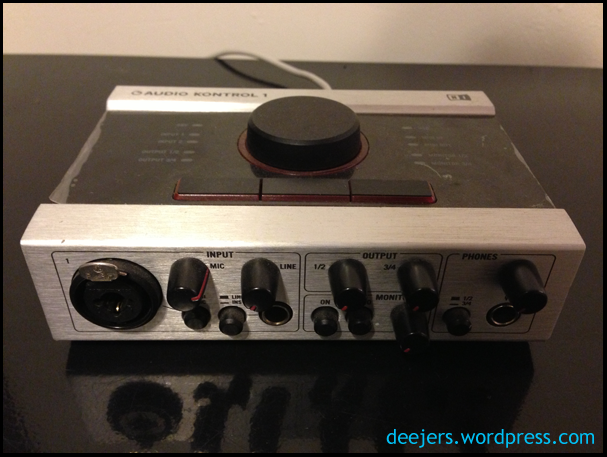 buttons&knobs | some words from a young digital musician. Despite being widely-known for his ego and ostentation, Kanye West chose to go with a humble design for his latest album’s packaging. Yeezus is pressed on a silver disc with no labels except for some small, inconspicuous text that wraps around the edges and provides the album’s credits. The disc is enclosed within a clear jewel case that is devoid of any art or labels except for a “Parental Advisory” warning and a red sticker that seals it closed. Kanye West was not the first artist to have his work released in this type of modest packaging, but he is credited with the design for Yeezus and could possibly earn himself a “Best Recording Package” Grammy later next year. The famous packaging of this self-titled work by The Beatles has led it to be commonly referred to as “The White Album” since its release on November 22, 1968. The record came enclosed in a pure white sleeve that lacked any title or credits, only having a serial number stamped into a corner on one side (and later, the album title embossed into the paper). Although this is not necessarily an example of an official release trying to appear like a bootleg, it is similar to the packaging of Yeezus in its minimalism and the great amount of intrigue that its design created. During a time when file-sharing and digital content piracy was becoming widespread and extremely common (Apple introduced the first-generation iPod in 2001), System of a Down released Steal This Album! on November 26, 2002. The album’s title refers to a book written by Abbie Hoffman in 1971 entitled “Steal This Book” and is supposedly a response to the band’s disappointment in fans listening to leaked copies of their new music before it was released in stores. The album was pressed on a white disc that had the band’s name and album title in a font that looks like it was hand-written in permanent marker and is enclosed by a blank jewel case without inserts or any more information. The packaging was intentionally designed to mimic the appearance of a CD-R that a person would use to copy and listen to pirated music with. Although this is an example of a film, the 2012 DVD-release of The Girl with the Dragon Tattoo utilized a similar aesthetic of the previously-described albums. The film comes on a silver Sony DVD-R disc that has the title strewn across it in a hand-written, permanent marker typeface that is not unlike that of Steal This Album! The design of the disc is a reference to the hacker protagonist in the film and managed to cause so much confusion for customers that retail outlets like Amazon had to release reassuring statements that it was the official art. Borat, a 2006 mockumentary from Sascha Baron Cohen also used a similar packaging style for comedic effect and to maintain a low-definition quality that is present throughout the film. Yeezus, and the other projects discussed here are just a few releases that have used a bootleg-like aesthetic, but I’m sure there must be plenty more cases of it in music, films, and other areas of art and design. If you’re aware of any other notable examples, please let me know! Blank CD-Rs can be bought by the 100-pack for around $20, and most modern computers have disk-burning capabilities, so it’s really not unreasonable to make your own releases if you want to. You can even get blank CD-Rs that have a white label on top that is perfect for painting and drawing. This album Mikey’s Imaginary Friends was made with some light passes with a couple different colors of spray paint and a silver Sharpie. Do all your painting before you burn your music on to the disk – this way, you can be sure that your CD will still function with the designs you put on it. If you accidentally painted on the bottom of the CD, then you’ll find out now and not after you spend the time burning your music to it. Be conservative with whatever you put on the CD – disk-readers are fine-tuned and will not play a CD if it’s too thick or heavy. It could also be possible that your disk might stick inside of a player if you’ve applied too much paint (this has happened to me before!). Sometimes just writing you/your band’s name and the name of the album on the disk is the best bet and will still look awesome. Make a decision on whether you want to burn your music as an Audio CD or an MP3 CD – I normally choose to burn mine as MP3 so that people can easily put my music on their laptops and iPods, but they frequently have problems playing in older car stereos that don’t support anything but audio tracks (and a lot of people LOVE listening to music in their cars). 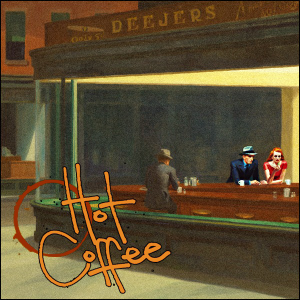 CD Sleeves can provide you with a space to make some really cool designs for your music. You can get thick cardboard sleeves for around the same price as a spindle of blank CD-Rs (about 100 for $20) and they will be able to take on paint while looking sturdy and professional. If you want to draw something, think of a simple logo or picture that represents what your music is about and put it on each of your CD sleeves. In some cases, a minimalistic cover with the album’s name on it is a good look; it’s really up to what kind of aesthetic that you’re trying to create and how you want your music to be framed. The album art for Jred Smyth’s Somewhere Between consists of a creature made entirely of black marker – a great example of simple design that portrays a cool and custom feel. I prefer to use spray paint for almost every kind of painting I do, but there’s really no limit to the types of tools that you can use on your album covers. Make a stencil, use a paintbrush, go crazy – treat your album covers like a canvas and use them as a way to represent yourself and your music. These versions of the deejersEP were painted with a touch of spray paint and a custom stencil. If you have some artistic friends (and even if you don’t), give them a stack of blank sleeves and ask them to get creative. Sometimes random and crazy drawings make the best album art and your friends might love taking up the challenge in their free time. I’m very fortunate to have some talented friends who are willing to share their skills. This copy of the deejersEP was painted by hand and outlined with permanent marker. If you can find some stickers that you don’t really want or have a use for, then you can turn them into your own stickers relatively easily. You can use packing slips, blank labels and name tags, or anything else that has adhesive on one side – a lot of these are thrown away as trash every day, so keep your eyes open at post offices and other establishments that might have them. Take a can of spray paint of a color that you like (with a large cap if you have one) and paint over all the stickers until you can’t read the text or see the images that were previously on them. Let the paint dry for an afternoon or two – the longer you let the stickers sit, the easier they will be to work with. Make a small stencil or take a paint marker, paint brush, or anything else you want and start creating. Now that you have some blank stickers that are a color of your choice, you can start having some fun and making whatever type of sticker you’d like. After everything dries sufficiently, you might have some excess paint that is on the paper that the sticker is on, but not on the actual sticker itself. You can choose to leave this, but it is usually messy and a hassle when you want to actually peel the sticker. This is because most stickers come on some type of wax-like paper and the paint can chip and smear on this part – this is actually a good thing, because you can easily remove the extraneous paint with one of your nails or a scalpel and have a very clean-looking finished product. Flyers can be a great way to publicize your music or shows in a creative way – posting them on bulletin boards and being that annoying guy handing out advertisements on the sidewalk can help spread the word about your work to your immediate community. Make something interesting, use bright colors, and make sure you post your flyers in places with heavy foot-traffic. Getting a massive amount of flyers can be costly, especially if you want multiple colors or glossy paper, but never underestimate the power of the lone pamphleteer. You can have your own business cards printed for relatively cheap and they’re a great way to share your contact information and where to hear your music. Making your own business cards will allow you to give someone a quick reference guide of how to reach you or hear the music you’ve made. I wouldn’t recommend making your own cards just because they are surprisingly affordable to have made by a printing company and you can still create your own custom design to be printed. Treat them like miniature flyers and give them out to anyone who asks about your work – they can be a valuable resource to have in your pocket. There are businesses that exist that can create any one of these things that I’ve discussed in this article; to use them might even be cheaper and it will almost definitely save you time. Depending on your skill sets and how much effort you put in, your products might even look better if they’re professionally made. Weigh out your options and decide what’s realistic for you, but remember this: the point of creating your own CDs is to present yourself and your music in a way that won’t just get lost in the rest of the noise. Treating your album releases and merchandise as extensions of your art will allow you to create your own aesthetic that is unique and memorable. 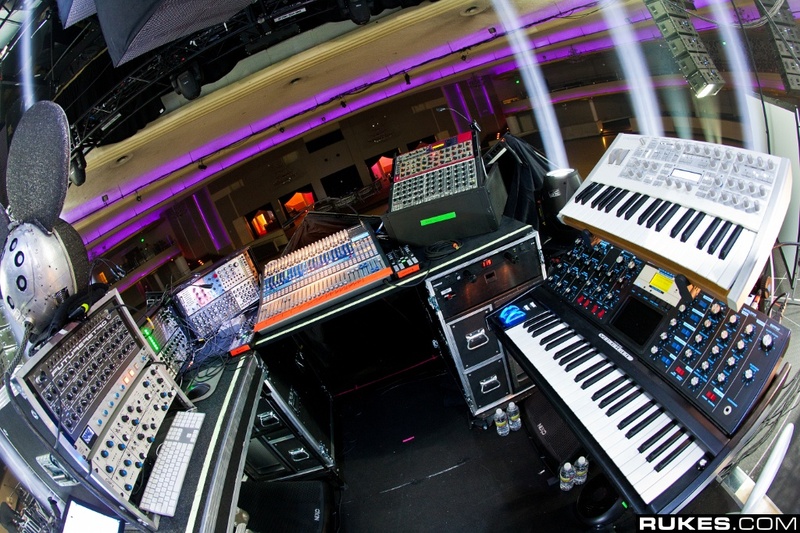 How the biggest electronic acts play their music live – a look into how some big names play their sounds in a live setting. Get Mobile! 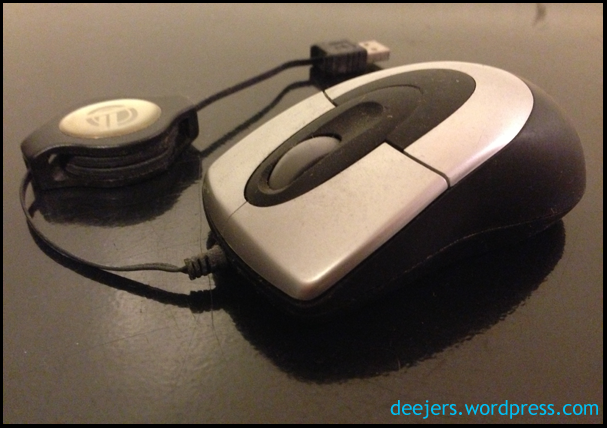 – Mobile apps and how they can be used in your studio. Take Control! 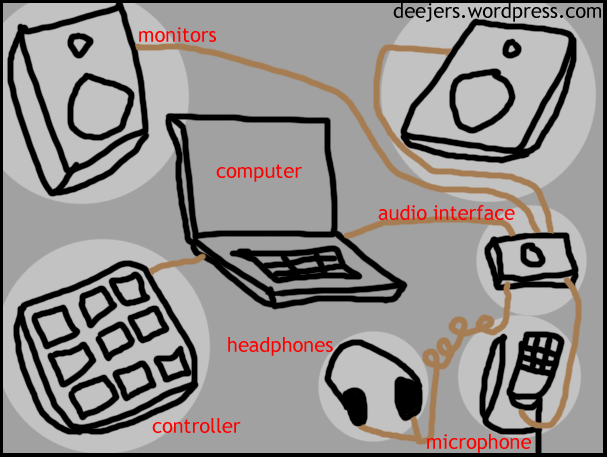 – Controllers and why they are important to a digital musician. 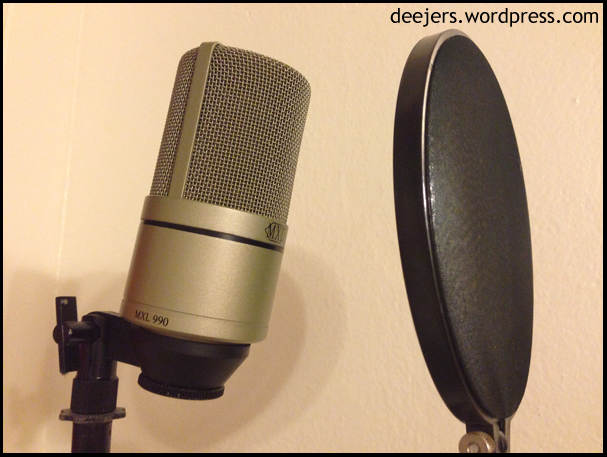 Give Your Studio Some Life – The components of a basic home studio. 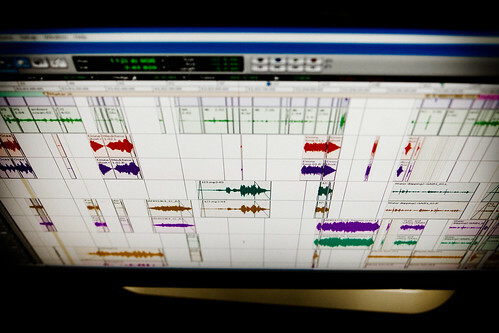 Choose Your Music’s Workplace – What a DAW does and how you can use one to make music on a computer. The mobile app industry has exploded since the debut of the iTunes App Store five years ago. 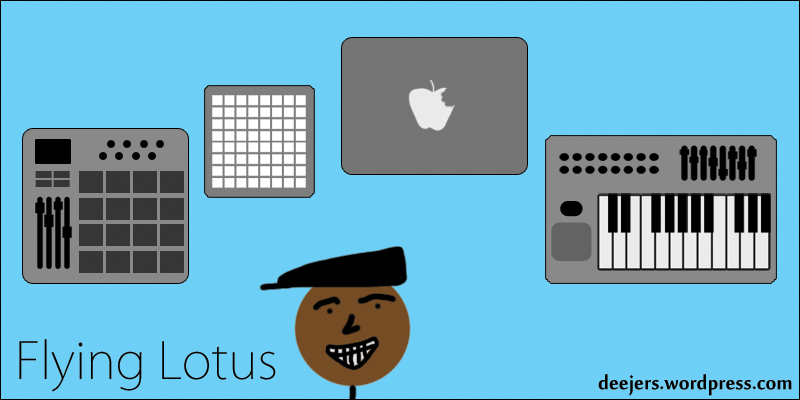 No matter what operating system your mobile device runs on, there are available applications to help you improve your process for making music (or just have fun messing around). For the sake of brevity, I’ll talk about a few options that are available to iOS users that will allow you to make your mobile device an active part of your studio and creative process (If you use an Android or any other platform, don’t feel left out; there are similar choices available to you as well). 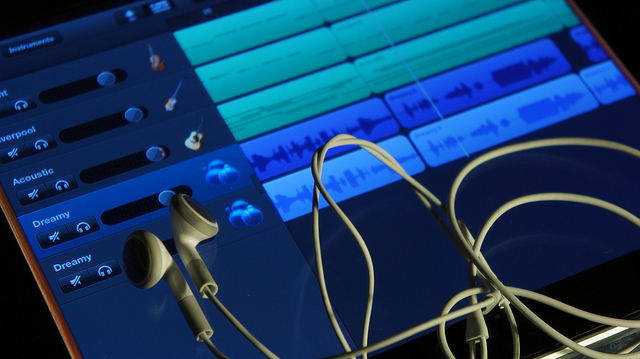 These different apps can turn a phone or tablet into an amazing tool for making music whenever the creative inspiration happens. In my last post, I discussed a few types of controllers that can be used for producing music electronically – thanks to mobile apps, a single device has the ability to fill the roles of a variety of these controllers or instruments. Depending on your needs and preferences, it could just be a better idea to invest in a large tablet device and a few applications rather than buying multiple controllers. After reading a bit more, you can make a decision on which route you should take with your studio. 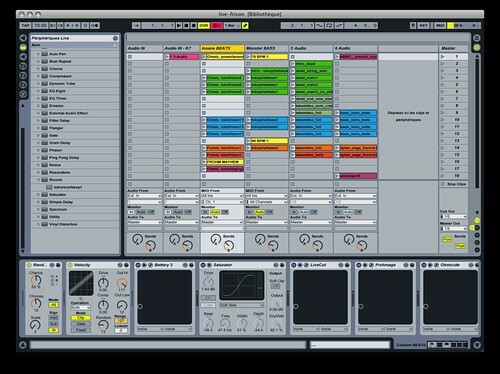 If you have an iPad, then you have an extremely powerful tool for digital music production lying in your hands. The large touch-screen, portability, and the variety of available apps will allow you to do a lot of cool stuff for music production. Like I said before, an iPad (or Android tablet) could replace every one of the controllers that I described in my previous post because of the different available apps that were designed to serve their functions. But even if you don’t have the iPad and its large display, its little brother can still do just as much and is even more portable. Apple’s iPhone is responsible for about a quarter of all mobile phone sales in the world and they come with over 800,000 apps that are currently available for purchase in the iTunes App Store. There’s an amazing amount of these apps that were designed for music production, but I’ll just focus here on a few types of them. Remember some of the software that I described in my first post? A couple of these are available in mobile form, and many others exist so that your musical ideas can be captured anywhere at any time. Last month, Steinberg released their popular Cubase DAW in a mobile version called Cubasis and Apple’s Garageband has been available and affordable for a few years now. These types of applications are extremely useful because they provide you a mobile workplace where you can create and save your ideas no matter where you are. I wouldn’t recommend these for doing full projects or as a main DAW, but they are a great resource for producing while you’re on the bus or during a boring TV show. These types of apps will turn your device into a playable instrument such as a synthesizer or a drum set. There are many keyboard apps available, and many of them have MIDI capabilities that can connect to your studio. I’m sure an experienced pianist or drummer would hate these because of how they feel to play, but they’re great for jamming a few quick melodies or sketching down some MIDI sequences to improve later. 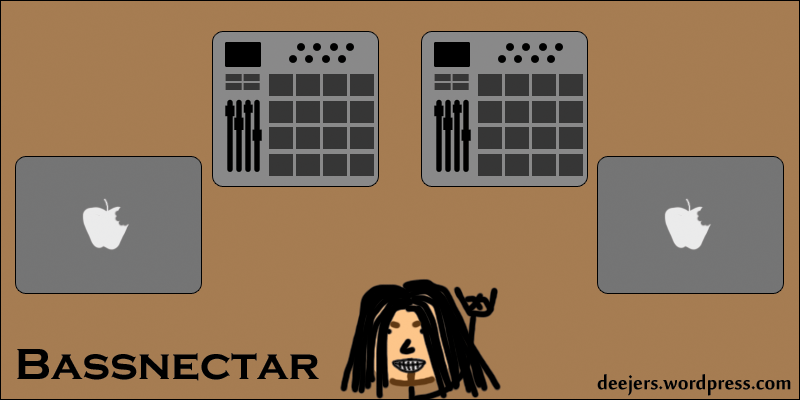 There are also many apps that emulate grid-style controllers, drum pads, and mixers. 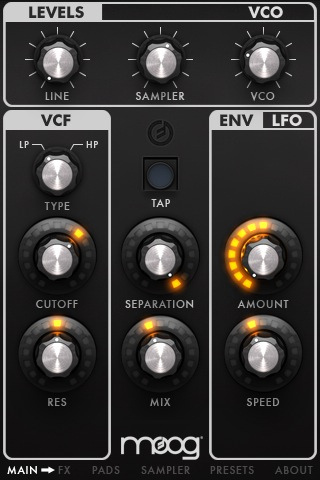 The ability to control an app by the device’s touch-screen makes using digital faders and knobs on a mixer application extremely fun and powerful. If you want to integrate your phone or tablet as an active part of your home studio or make it a hub for your other devices, then it is important to get some hardware in order to do so. You will need to get adapters such as a MIDI or a guitar interface that will allow you to hook your device into your studio or to connect your instruments to your mobile apps. These interfaces simply hook into your iPhone’s 30-pin dock connector or the new Lightning port and provide you with inputs and outputs for communicating MIDI or audio data. 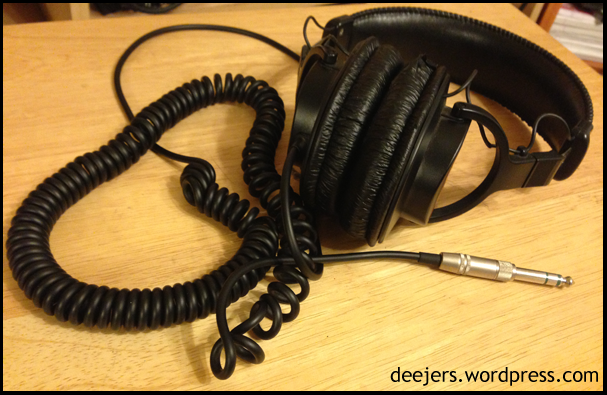 Once you have this connection, you are ready to treat your mobile device as a new component in your music studio or as a recording hub for your other devices. These types of apps can transform your phone or tablet into an active part of your main studio or even give you a separate environment to work with while you are away. Like I’ve said with all my recommendations, choose which apps or devices you think will best complement or contribute to your creative process. It’s possible that you may find mobile devices frustrating and hard to work with, and there is nothing wrong with that conclusion. However, inspiration happens at random times and places, and a mobile device with a couple great apps on it can allow you to capture it when it strikes. Choose an app or two that work for you and you will have a powerful musical creation tool at your disposal at all times. So now that we have our DAW and some basic hardware, it’s time to start thinking about how you’d like to communicate with your computer and its software. 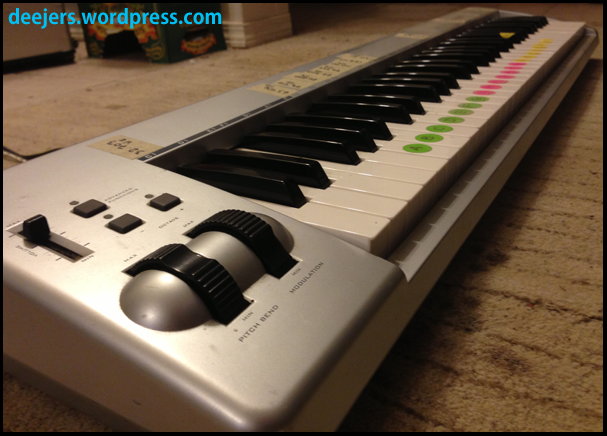 A QWERTY keyboard is nice for writing this blog post, but it won’t be my weapon of choice when I want to work on music. Peripheral devices, also known as controllers, will allow you to have a tangible instrument to play with while working in a mostly digital realm; they help provide a distraction from the exhausting glow of the computer’s screen and focus your attention into something real. At the very least, they will help you move more fluidly throughout your software, help facilitate decisions, and generally reduce the time spent not playing music. 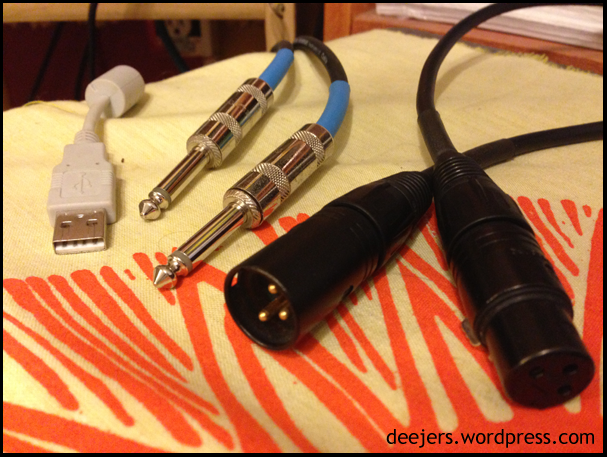 MIDI is how controllers talk to your computer – here is a MIDI cable and interface, as well as USB, which can also handle MIDI. 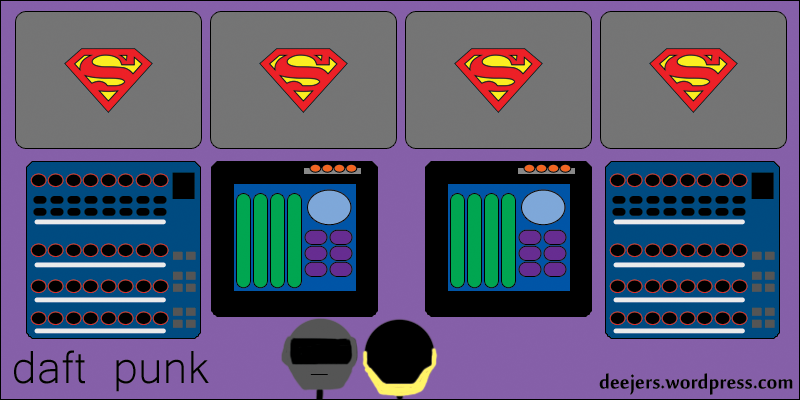 There are a few different types of controllers, each one having different purposes and powers. 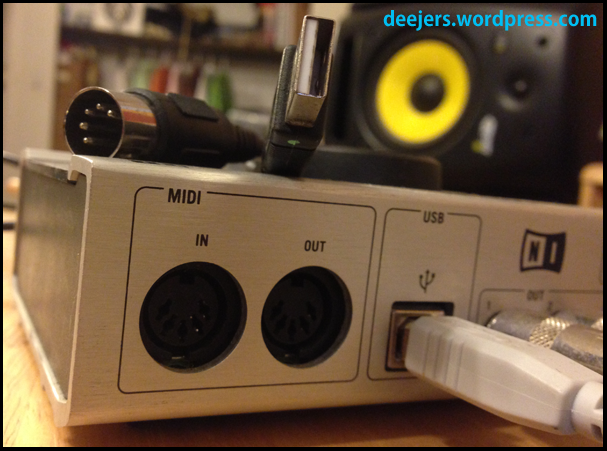 Almost all controllers communicate with a protocol called MIDI, and thanks to the evolution of technology, they are now able to communicate through a USB connection rather than with a special MIDI cable and interface. MIDI messages, sent by controllers, tell electronic instruments and software what to do (such as which notes, what tempo, etc.) and allow you to be more expressive with your computer. The style of music you would like to make or how you’d like to make it will determine which controllers are right for you. This M-Audio Keyboard has 49 keys and can connect with both MIDI cables and USB. Keyboards are the electronic version of the piano, and probably one of the only controllers that resembles a traditional instrument. These generally come with 49 keys (four octaves) and are an amazing tool for songwriting and getting musical ideas flowing. If you have experience with playing piano or just need some sort of peripheral device to start with, then these are probably your best bet. I think a MIDI keyboard should be considered by anyone making music with a computer; they’re fun to play and are a great starting point for the creative process. Also, pretty much any MIDI keyboard is compatible with any software you can find, making them extremely reliable and easy to use. 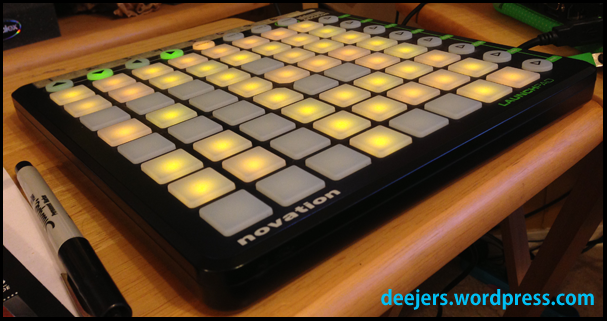 The Novation Launchpad is a grid controller consisting of 64 back-lit buttons. These types of controllers don’t really do anything that a MIDI keyboard can’t, but they do provide a different sort of feel and tactile feedback that is very important. 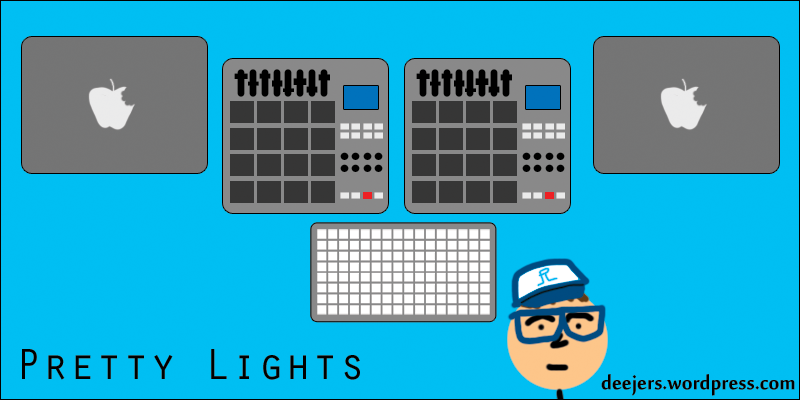 They usually consist of rows of rubber pads that can be used to control drum machines, activate samples, or do almost anything you assign to them. Many of the newer types of these controllers also have LED lights behind the pads to give the user more information or to serve different functions. Drum Pads were designed for – you guessed it – playing drums, but some artists have began using them to play their music in original and creative ways. It’s really up to the musician’s imagination to figure out how they want to use the power of these controllers. The Novation Nocturn has 8 knobs, 16 buttons, and a cross-fader that can be assigned to whatever you’d like. There is a lot of variation within this type of controller, but each one generally consists of two things; knobs and faders. These are designed to control the volumes of different sounds, modulate effects, or do anything else that makes sense to control with faders and knobs. Just like with drum pad controllers, there is a lot of potential for creativity with mixers – they are rather simple but will provide you with a lot of control over your music – it’s up to you to harness it. It is also important to note that there are controllers that fit into a couple of these classifications. 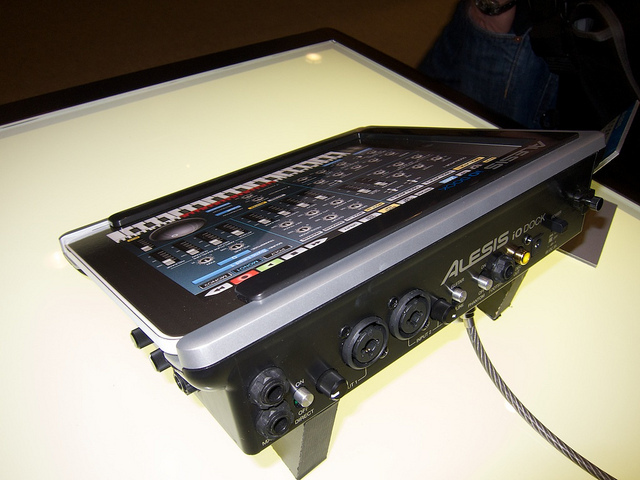 It’s not uncommon for the higher-end MIDI keyboards to have drum pads and/or mixers on them as well. 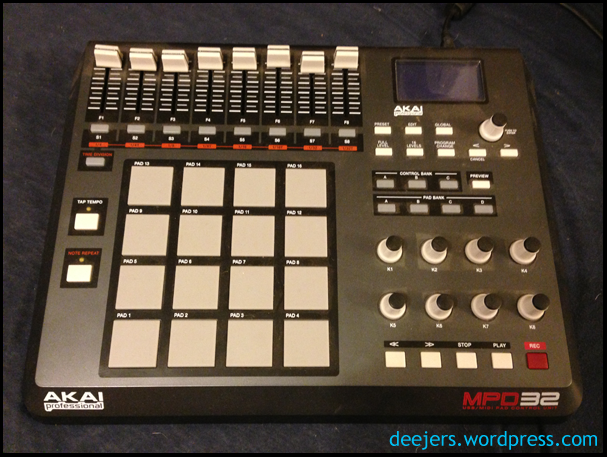 There are also many drum pad controllers that come with a bunch of knobs to fiddle with and a built-in mixer. These types of controllers are almost always more expensive than their simpler counterparts, but perhaps they might be a good investment if multiple types of controllers fit your style. 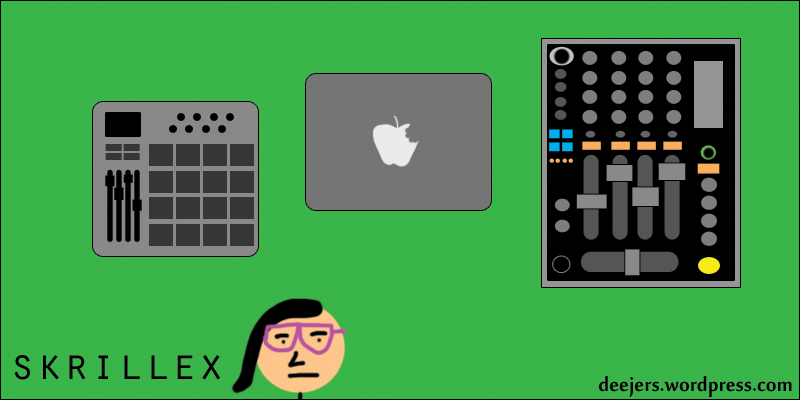 So these are the three types of MIDI controllers – keyboard, drum pad, and mixer – that make up the basic varieties that you can buy for making music with on your computer. It has also become very popular for the more tech-savvy musicians to create their own controllers to produce and perform with using available hardware and materials. The Monome is an example of a great independently-made controller, and it has even been adopted by large electronic acts such as deadmau5, Pretty Lights, and Sound Tribe Sector 9. 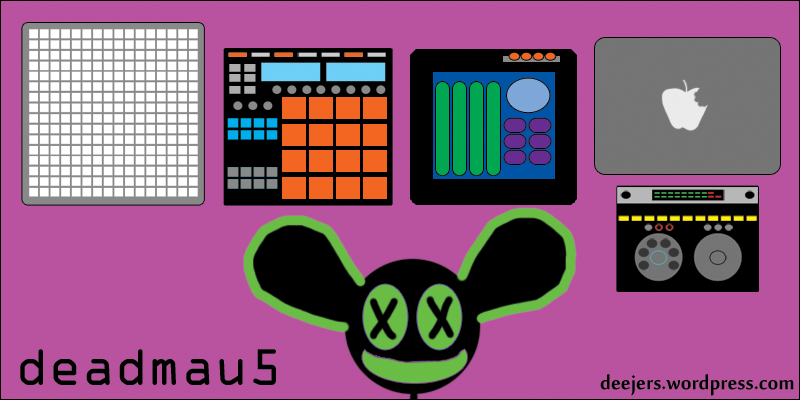 Controllers are what make producing electronic music fun; they are the instruments and tools of the digital musician. Try many different options, and think about which controllers inspire you the most or take care of your musical needs and desires. Finding which one (or combination of a few) that works best for your style is crucial to having an enjoyable and creative time while making music. 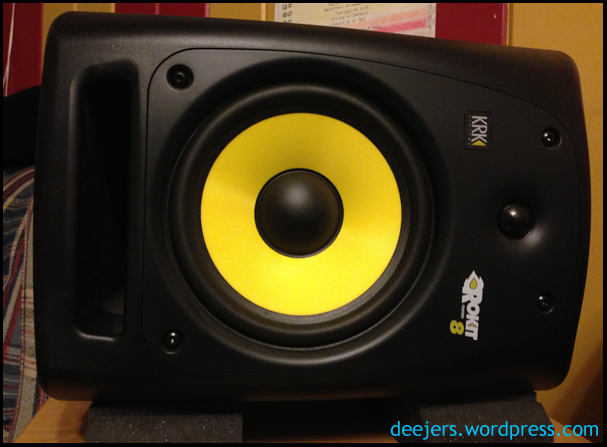 Now take control of your studio!